A couple of years ago I went to work for a Catholic university of the St Ignatius of Loyola and Marymount persuasions. While I’ve made my career in education, most often at the college-level, this was my first religiously-affiliated institution. Always the diligent researcher, I went deep when preparing to interview for the job. Part of my motivation was professional—I needed this prospective place of employment to know that I’d done my homework. Selfishly, I also needed to understand the values of the private, religiously affiliated institution. See, I wasn’t raised Catholic. In fact, even though both of my parents affiliate as Episcopal, WASP is the closest to religion I come. And by WASP I mean the hair-band wearing, knowing how to use the appropriate fork and then stabbing you in the back with it part…not the actual Protestant part. But, as usual, I digress. In my research of this Catholic university in the Jesuit tradition, I was impressed by what I learned. The Jesuits are known as teachers and seekers of knowledge. Among other things, their educational tradition seeks to produce not just successful leaders, leaders in the service of others. It’s kind of their jam. To this end, I was very drawn to the idea of a mission-driven university. This was especially true provided this university’s triumvirate mission: the encouragement of learning, the education of the whole person and the service of faith and justice. I’ll admit, at the time I didn’t really understand the service of faith piece. But, the other components certainly read like the kind of place I’d like to be producing our future (in the form of college graduates). I didn’t learn until I had an employee ID number that the mission truly saturates the being of the institution. It is in the classroom. It is in the activities and programs in which students participate. It is in the engagement of the alumni. It is a pleasure to work in a place that strives to walk the talk. I’ve also come to understand that this is pretty standard across other Catholic-Jesuit institutions. Values are important. Being a good person is important. Striving to create a more just society is important. You can also go here to learn more about the team. Speaking of serendipity. I had this post for Jesuite pastries scheduled for later in the month. I actually didn’t think to line up my Jesuit themed bits and pieces until yesterday. Sometimes I wonder about myself. 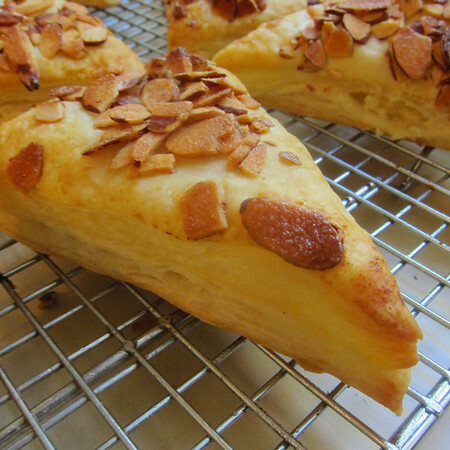 Jesuites are a french pastry filled with almond cream and topped with almonds (and sometimes a layer of icing). They get their name from the three-pointed hats Jesuits are said to have been fond of wearing back in the day. Over the holidays I had big plans to make my own puff pastry. But, unlike most of the country, the sun was shining in Southern California and I abandoned my winter-dark kitchen to go play outside. So, for this recipe and its partner (that I’ll post later in the month), I used prepared pastry dough. This recipe makes about a dozen Jesuits with two sheets of puff pastry. 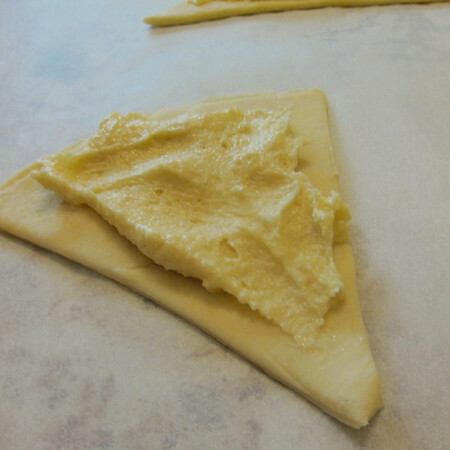 I was pretty wasteful with the dough…a strategic cutting and you could get several more out of it. In a medium bowl, sift together almond flour and all purpose flour. Set aside. Using an electric hand mixer, cream butter until it is the consistency of mayonnaise. Sift-in confectioner’s sugar and mix on high until fluffy (2-3 minutes). Scrape down the sides of the bowl and add the almond mixture in 2 additions, combining on low. Scrape the bottom of the bowl to combine all ingredients. Add in 1 egg and combined on low until mixture is smooth (about 30 seconds). Refrigerate until cold (at least two hours). Can be made up to three days in advance, kept in an airtight container in the fridge. 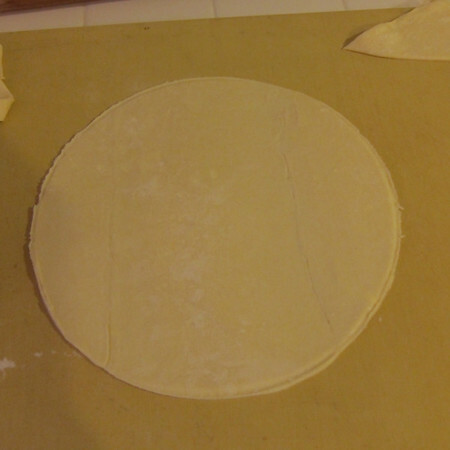 On a floured work surface, roll-out puff pastry to roughly 14X18 inches. Using a 12 inch bowl as a template, cut out a round using a sharp knife. Cut the circle into 6 equal parts. You should have enough dough left at the corners of the rectangle not included in the circle to cut 4 additional triangles. Repeat with second sheet of pastry. Space five triangles on a parchment-lined baking sheet. 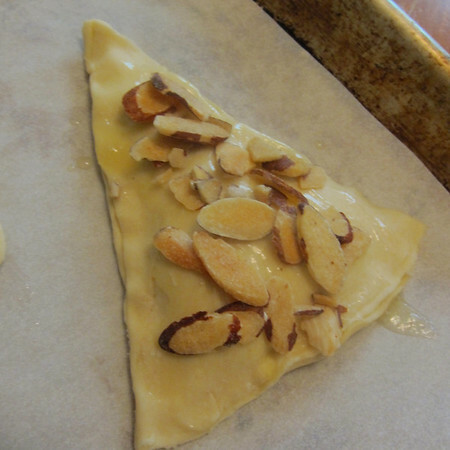 Spread about a tablespoon of almond cream evenly across each triangle leaving about a centimeter along the edges. Top each triangle with a second triangle, pinching the edges (they’ll break free in the puffing-up process…this is supposed to happen). Repeat until each triangle on your tray is topped. 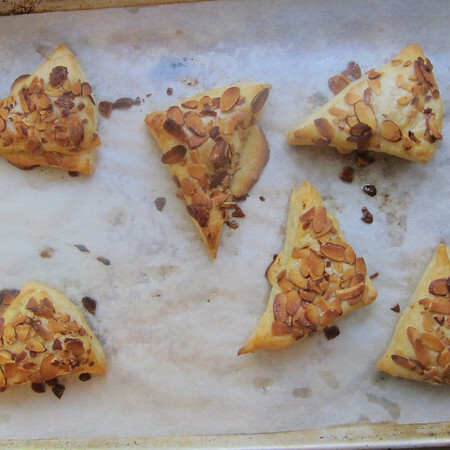 Paint each pastry with egg wash and top liberally with flaked almonds. Repeat with second baking sheet. Bake baking sheets one-at-a-time for 20-25 minutes until tops are golden brown and pastry puffs to about 3 inches. Last year on my visit to Corte Madera, Ca. at the charming little ‘Cafe Champagne’, I tasted the very best ‘Jesuit, Almond’ puff pastery ever. Unfortunately, I live in Cambridge, Ontario and I’m not able to have this delectable little treat as often as I like. Hi Erika- I really had no idea these existed until I began working at a Jesuit University. I’ve kept my eye out for them at local bakeries to no success. Glad you found some! Thanks for commenting! If you ever get to San Antonio, TX, there’s a high-end grocery store called Central Market, that makes Jésuite in their bakery. I’ve been trying to find a recipe for them since we’ve moved. The flavors and texture are amazing!